With Quinnipiac being in the small, mid-major Northeast Conference, it is not very often you will see a player from the NEC leading a major statistical category in the NCAA, especially with the season two-thirds of the way through. But Felicia Barron is the exception. 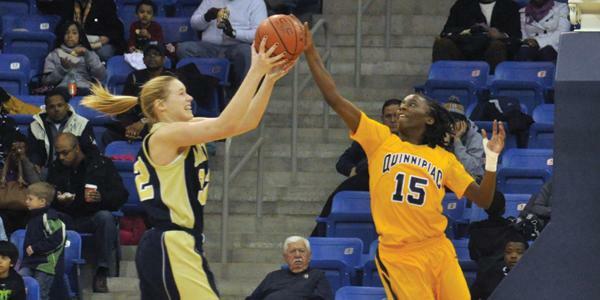 Quinnipiac guard Felicia Barron, the country’s leader in steals, takes the ball away from Mount St. Mary’s Jessie Kaufman in the first half of Monday’s game. Barron leads the nation in steals per game (4.57) and has 96 steals total this season. She is also tied for the most steals in a single game this season when she had 12 against Bryant on Dec. 3, which was the most for a single game in program history. Barron, a redshirt junior, has always considered herself a defensive player. Last season as a sophomore she had a team-high 63 steals. She credits her aggressiveness on the defensive side of the ball and being blessed with long arms as the primary reasons for her success this season. Barron’s time at Quinnipiac has not always been as smooth as this season. Barron did not play a full season until last year as a red-shirt sophomore. 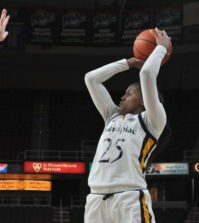 During her freshman year Barron only played in eight games before missing the remainder of the season with a knee injury. The following year as a red-shirt freshman, she only played in 11 games before having her season end abruptly with another knee injury. This season is her first season playing without braces on her knees, and head coach Tricia Fabbri said it has been a noticeable difference. Barron’s impact goes beyond just her defensive performance. 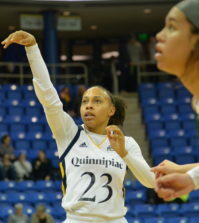 She is also an offensive threat for the Bobcats, averaging 17.6 points per game, second in the conference. Barron has also been an integral part in shaping the team’s identity as a defensive-minded team. In Saturday’s game vs. Wagner, Quinnipiac stole the ball on Wagner’s first four possessions, two of them by Barron, and scored eight points in the first 1:42. Barron’s performance and leadership has also helped lead the Bobcats to a recent six-game winning streak and has them in second place in the NEC just one game behind Sacred Heart. While Barron is still waiting for it all to sink in that she is the NCAA leader in steals per game, her focus remains on one thing: making the NCAA Tournament.